! Our Set up Service is Available ​24 Hours a day, 362 days a year. Events 24 hours a day, 7 Days a week! 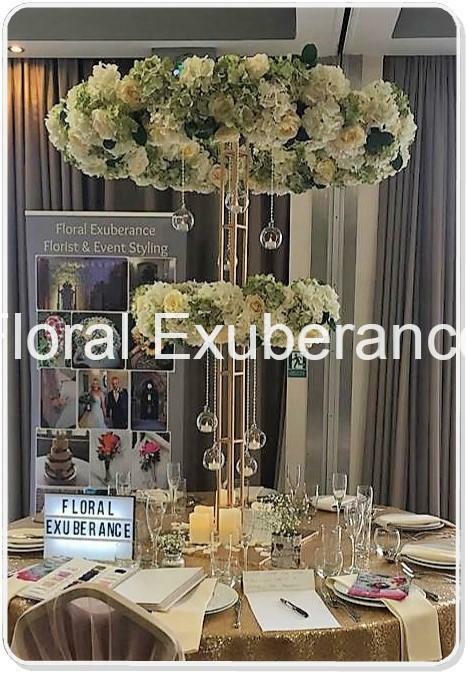 The 5ft Giant Floral Halo is the perfect display for wowing your guests. The Halo can be created in a number of ways : You can use just top halo, or have both, or have the lowest one. It is large dramatic and filled with lots of fresh or silk flowers. The Halo is an impressive structure that really does create an impression on entrance. We build and customise the halo to meet your desired colour schemes and styles. The halo can be changed to match more of a enchanted forest style or more of a lighter floral designs. The structure permits us to get creative so do get in touch for more information. We add the glass hanging spheres to be used with led or real candles.